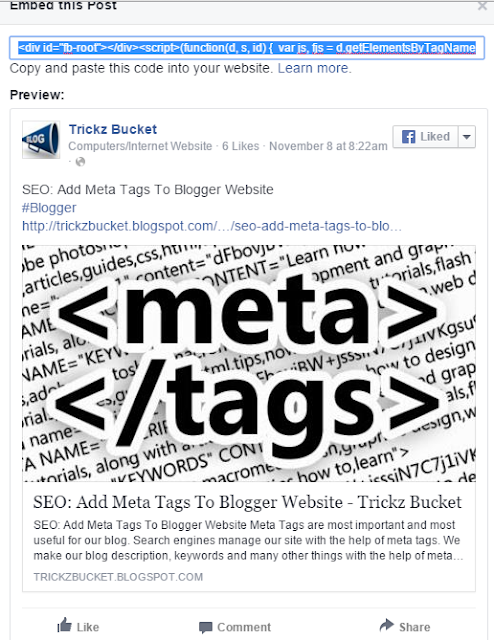 How To Embed Facebook Posts in Blogger? How To Embed Facebook Posts in Blogger? Embed Facebook status updates, links, pictures and videos in blogger with facebook embed option. Social media is now over taking the internet and it is now becoming the much more important than the organic search. Having a good number of social media fans helps you drive direct traffic to your blog or website. Few years back, social media was not so much popular but now social media is changing the ways to use internet. That's the reason why every social media forum allows you to share their content on internet. For the effect, Facebook following Youtube and Twitter, has launched 'Embed Post' feature which will allow blogs and websites to share status updates, pictures and videos that are on Facebook. Let's have a demo for you! How to Embed Facebook Posts to your Blogger blog? Just like Youtube, Twitter, Dailymotion etc Facebook comes with an embed option. That is the easiest way to engage your readers with your social media activities. Let's see how it works! 1. 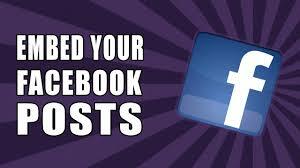 Select your desired post on Facebook. It can be a status update, link, picture or a video as long as it has been shared in public. 2. Hover over the upper right corner of the update and a drop down arrow will appear. Click on that arrow. 3. In that drop down box, select “Embed Post”. 4. A text box will appear with code for you to copy and paste along with a preview of what the post will look like after you embed it. 5. Paste the code into the text editor of your post where you would like it to appear. That's it. You have successfully embedded the Facebook Update. 2. This feature only works for the posts shared publicly. It does make sense to ensure the privacy of Facebook users. 3. If the author changes or deletes the embedded post, a message will display that it's no longer available. 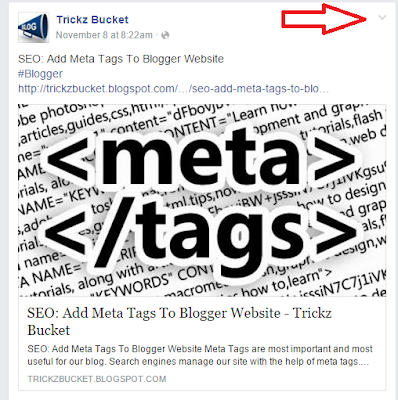 Trickz Bucket: How To Embed Facebook Posts in Blogger?